Welcome back to my blog friends! Today I am sharing ideas on how to use Exit Tickets in the bilingual classroom. Exit tickets are a way great to assess your students quickly and effectively. I do not use these every day, but I do try to incorporate them at least two to three times per week. On other days, I utilize Plickers for an easy way to check for understanding and collect data. (Blog post to come soon). So how do I use these and what are the benefits? Keep reading to find out and grab a FREEBIE. During whole group teaching, I always have the same students that are participating and showing their understanding, while the rest of the class is quiet. 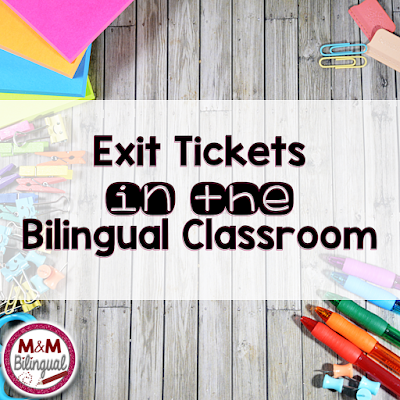 With exit tickets, all student are accountable to be paying attention. I do tell them "Class, there will be an exit ticket after this so make sure to focus and pay close attention." This promotes 100% engagement. Through this exit ticket students can self reflect. I'll have students that cannot answer come up to me and tell me, they didn't understand or know what to write. I can do a quick reteach and it's wonderful to see their faces when the lesson clicks and they suddenly "get it," Also, I love seeing those that can answer accurately right away and their comments such as a confident: "I know this!" Writing about content is such an important skill for my students. Exit tickets help me evaluate their writing and they get extra practice in writing about what they've learned. This is the perfect time to spiral in proper capitalization and punctuation in a quick way. Students post these up on my wall and I am able to gauge almost instantly who needs extra help. During small groups, I am able to group based on their needs and reteach the skills necessary to master the concept. 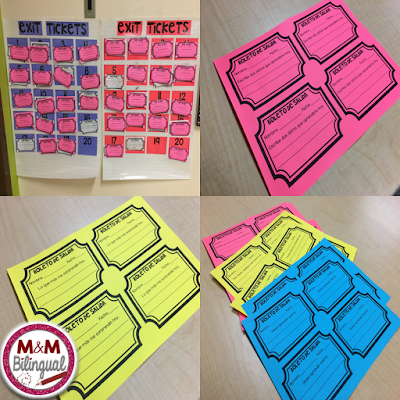 Here are a few pictures of exit tickets in action and how I display them in my classroom. I team teach so I have two anchor chart sheets posted by my door. These charts have squares with numbers on them. Students in my class are assigned a number at the beginning of the year and that's where they will place their exit tickets throughout the year. Here is a freebie you can use right now with your students. 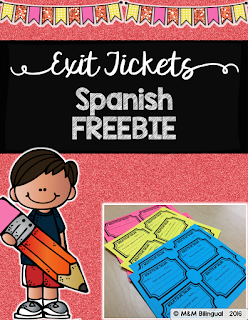 My Spanish pack of exit tickets is available at my TpT store! These are perfect to use with any content and promote self reflection after a lesson. 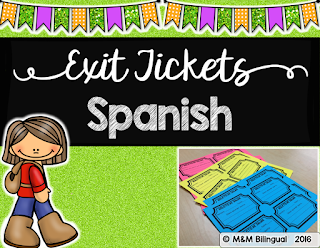 Have you used exit tickets in your classroom? Let me know how they've worked for you! Until next time friends! That's very cool idea. I should try it in Chinese too. Thanks. I utilize Plickers for an easy way to check for understanding and collect data.